My affection for the students I teach (high school students) has been demonstrated lots of times here on H&R. I have defended them from cliched attacks on more than one occasion; I have called teenagers the "truest form of human beings." But liking them doesn't mean I won't be critical of them from time to time. In fact, it is out of affection that I am critical of them. I think, at least "live," in class or in the halls, they might even appreciate that. Mozart, working for a living. Salieri scheming. "Hey, Mr. Mat. I heard your CD over at _____'s house. I loved it. Awesome stuff. 'The Magician' was my favorite track." "Thanks, ______. I appreciate it." "No problem. I would get a copy of it, but I just don't pay for music." "Well," says I, "I'd be happy to give you a copy if you like it so much. Stop by my office." So, I got to thinking about that little exchange. Some of my students have seven million ways to get free mp3s; including, much to my surprise, recently, a site that allows one to convert the sound from You Tube into mp3s. They essentially steal music all of the time. 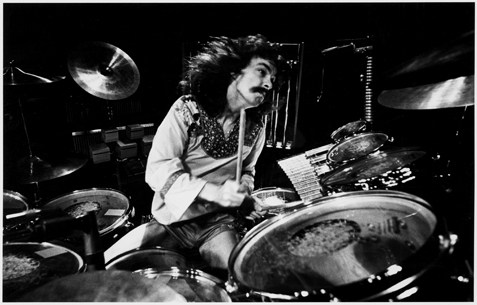 Neil Peart: One of my most influential heroes. for every Rush album I ever owned. The weird part is, they think it's just fine to bootleg music. But is it their fault? Now, here is the nature of my criticism: It's not a "kids today" thing. It's not an angry reaction. It's not outrage. It is a cold, logical analysis. So, let's not go the direction of: Damned kids! Let's just decide why they steal music. As far as I'm concerned, the answer is simple: intangibility. Too much of our world has become intangible, due to the "virtual" nature of daily life. I've talked about this before. Too much stuff in is intangible, both in adult and teenage life. Stealing a file is not the same as stealing a pair of shoes; not to them. And not to us. Really. Come on. Admit it. If we're being honest, how many of us adults would steal a pair of shoes and how many of us have taken software we didn't pay for? I'm not saying there aren't people out there who have walked the straight-and-narrow with files and music and software, but they are probably in the minority. Right? So, let's not be too hard on the kids. Not until we revise our culture to truly respect art and not until we realize that the makers of virtual products work just as hard as carpenters and shoemakers. My own philosophy on this as a dad: I will be as generous as possible with music. If my kids want mp3s, I'll buy them as many as I can afford. (After all, buying them music is like investing in their souls -- yes, even the "garbage" that they listen too, you curmudgeons out there.) And I will teach them the respect the work of the musicians who bring my kids so much joy through hard work and talent. They deserve at least as much respect and cash as a person who knits sweaters right? So, young people of the world, here's just one guy's statement: I have never and will never steal music. If I can pay, I will; and if it is offered for free, I'll take it. But I do think it is important to pay, if only out of respect for the arts. Crap. Even when I try to be critical, I wind up defending the little buggers. Derned kids. A better analogy might be to think of the days befre virtual music. Would they walk intoa Sam Goody and steal a CD or an audiotape? No. However, I did have many friends in my past who bought albums and taped them for me. So how different is it now, really? I thought it might be because they saw the excesses of the music industry and thought the whole thing over-indulgent and therefore decided they didn't want to pay large amounts (or any amounts) just so that they could contribute to some rock star's rider (I think that's what they call the silly lists of things that are demanded backstage before a famous modern musician will deign to face an audience.) In the same way, people download movies, thinking that movie stars are really paid absurd sums and that they, the consumers, should not have to subsidise this nonsense. But perhaps that is merely my outlook (not that I actually download anything - mainly because I haven't figured out exactly how to). But, leaving all that aside, may I wish you and your family a very Happy Christmas and New Year.